Painted in watercolour, with a touch of white gouache. Check this image out for sale in high-quality prints, canvases, t-shirts, iPhone and iPad cases, stickers, throw pillows and tote bags at my PETER XAVIER PRICE REDBUBBLE SHOP. If you appreciate my artwork, please show your support by taking a few short moments to 'Like' my Facebook Page, at Peter Xavier Price - Illustrator. Many thanks! Thank you, if you read this! Awesome! 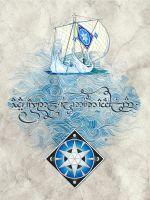 The pure light of Silmaril, the brave heart of Elwing. The sea is roaring and mourning the Mouth of Sirion. This is a poetic comment, which is one of my favourite kinds as it makes me think I'm doing something right. Thanks! Thanks Terry! Been a great fan of yours for a many many years now! Thank you so much and sorry for the late response - appear to have missed your comment! Great painting, I like the colors and the composition. Congratulations your work has been awarded the honor of the "Best of the Best" at NaturesHaven. Please enjoy Volume |Xjournal feature which showcases your art. Why thanks very much! I couldn't seem to find it in the folder you mention, but I appreciate the thought all the same! You're very welcome!!! First of all. you deserve it! Second of all, I'm limited with what I can choose, so I choose only the Best, and from there, I can only Feature ten of the Best of the Best, being Featured on the first Friday of each month. LOTS of competition for that Honor. So don't be upset if you don't get that out of the Hundreds from the Featured Folder. Your wonderful art has been placed in our Featured folder. Congratulations! This is marvelous, Peet. You continue to outdo yourself. was just how nicely you handled the water. I'm being a pedant Thanks again! You depicted a stormy water perfectly. I can almost feel the breeze and wind there. I've never seen sea during storm but I imagined in in the same way. As for Elwing, I hope she felt exhausted after the whole journey and got no other company but birds for the whole eternity. Forever loneliness is the good fate for mother who leave kids to mass murderers to keep gem. Haha, that's one way to put it. So much about choice, fate, sacrifice providence in Tolkien. Sometimes there're are never any right decisions, and you just go with your gut and see what happens. Really glad you like This one remains a soft spot for me. The water looks amazing! That's my favorite part of this picture, though I also think you've done an incredible job on the clouds, and on the feathers of Elwing's wings, and those rays of light coming out of the Silmaril are very eye-catching. Thank you so much, and my sincere apologies for such a late response! No that's okay! You're very welcome! Makes me happy. Bravo friend, Bravo! Ah, thank you so much for your kind words. I love making fans of Tolkien 'geek out' It's the same feeling I get when I look at art that speaks to me too (esp. when it comes to THIS particular legendarium), so I very much appreciate your compliment! Cheers! This is one of my favourites! The contrast between the deep purple and the green of the sea! Awesome! You are beautifulA special journal today because this week (that has just begone) already has me on an edge again. The issue here is what is art and who is an artist. The triggers where people telling others they are not, and people bringing themselves down over their own art. Both equally bad and destructive and absolutely counter productive. 1. Admiration of the work of another has nothing to do with your own work. 2. All work is individual and can only be judged upon the persons ability.